Too often we see people taking better care of their vehicles than their most important relationships. Here's a little tool we created that couples can print off and use for discussion on a date night. 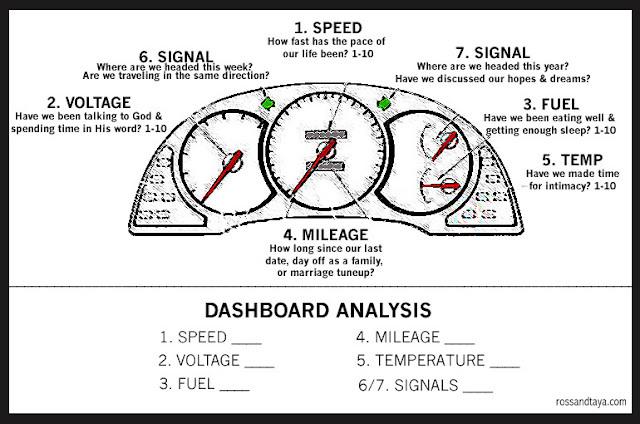 Feel free to print a copy for each of you, quickly mark your score for each of the seven gauges, then switch dashboards and discuss your answers. Choose 1 or 2 areas that you want to focus on over the next week. 1. Other than at mealtime, when was the last time you & your spouse prayed together? 2. On a scale of 1-10, how fast has the pace of your life been this month? *People who answer both questions will be entered into the drawing twice. The drawing will end on one of our favorite days of the year: Sunday, February 14! i loved this post, ross. it reminded me of the time a marriage counselor told us that if anything else breaks down in our life, we would fix it at our immediate convenience. but, when it comes to marriage people wait to get help as a last resort. on a scale of 1-10 our life has been nice and mellow. maybe a 3? gotta love winter in alberta. need i say more? we're locked up tight in the house unless we have something really pressing or we're stir-crazy. the last time we prayed together was probably 2 months ago. about our kids and things i was going through. What great questions. Life is so busy and I would say our pace in the last month would be an 8. As for the last time we prayed together I don't know. The dinner table is our place to pray and we need to work on that. Thank you for the wonderful posts to remind us to slow down and pray. I'll brave it son...probably the last time dad and I prayed together fervently was when the sale of your house fell through. Although we pray daily, praying TOGETHER has never been something that we have done consistently. On a scale of 1-10 how fast paced has our life been over the past couple months...probably a 5. Business keeps our lives pretty busy, but the winter does slow it down somewhat. Great post kids...it's always good to examine our lives.